School’s out for the week, and spring break is a great time to reconnect with your busy family. If you are looking for a fun and affordable adventure this spring break, look not further than Eureka Springs, Arkansas. This historic Victorian village offers fun for the whole family. Check out these great Eureka Springs Attractions that are sure to make this Spring Break in the Ozarks the best your family has ever had! 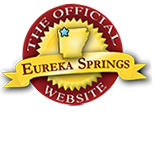 For more information about March Eureka Springs events, Click Here. View from the horse at Rocking Z Ranch. Spring is a time of dogwoods and red buds in the Ozark Mountains. What better way to see them then on horseback? Adults and kids alike enjoy horseback ridding around Eureka Springs. Try Bear Mountain Riding Stable and Dude Ranch for a ride close to town. If you want to truly enjoy the Ozark countryside, Rocking Z Ranch is the spot for you. Eureka Springs is home to America’s Most Haunted Hotel. It is no surprise the ghost tours are a big hit for families with older kids in Eureka Springs. Some of the most popular ghost tours are: Crescent Hotel Ghost Tour, Spirits of the Basin Tour and Downtown-N-Underground. Click the links for more information and tickets. Safe and secure, Ozark Mountain Ziplines are the #1 attraction in Eureka Springs! Have a roaring good time at Turpentine Creek Wildlife Refuge spending the day with large cats (tigers, lions and more!) and other exotic animals. A nationally recognized refuge, Turpentine Creek is one of the largest facilities of its kind open to the public. Click here for tickets. Go spelunking in one of the Ozarks prettiest caves! Cosmic Cavern is an underground jewel, and its fun-for-all-ages cave tour is sure to impress. The tour lasts 1 hour and 15 minutes and is a steady 64 degrees year round. Click here for more information! This entry was posted on February 24, 2017 by service424 in Attractions, Crescent Hotel, Eureka Springs Lodging, Family Fun, Ghosts, Things to Do, Weekday Getaway and tagged adventure, arkansas spring break break, Bear MOuntain Riding Stable and Dude Ranch, Cosmic Cavern, Eureka Springs, Family, Kids, Ozark Mountain Ziplines, Rocking Z Ranch, spring break, Turpentine Creek Wildlife Refuge, Vacation.